Color, or colour, is the characteristic of human visual perception described through color categories, with names such as red, orange, yellow, green, blue, or purple. This perception of color derives from the stimulation of cone cells in the human eye by electromagnetic radiation in the visible spectrum. Color categories and physical specifications of color are associated with objects through the wavelength of the light that is reflected from them. This reflection is governed by the object's physical properties such as light absorption, emission spectra, etc. A monochromic image is composed of one color. The term monochrome comes from the Ancient Greek: μονόχρωμος, translit. monochromos, lit. 'having one color'. Phase Alternating Line (PAL) is a colour encoding system for analogue television used in broadcast television systems in most countries broadcasting at 625-line / 50 field per second (576i). Other common colour encoding systems are NTSC and SECAM. SECAM, also written SÉCAM, is an analogue color television system first used in France. It was one of three major colour television standards, the others being the European PAL and North American NTSC. Luminance is a photometric measure of the luminous intensity per unit area of light travelling in a given direction. It describes the amount of light that passes through, is emitted or reflected from a particular area, and falls within a given solid angle. The SI unit for luminance is candela per square metre (cd/m2). A non-SI term for the same unit is the nit. The CGS unit of luminance is the stilb, which is equal to one candela per square centimetre or 10 kcd/m2. 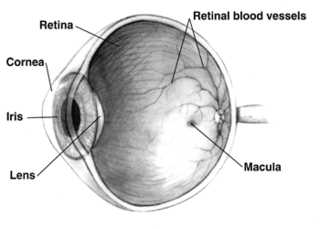 The eye has limited bandwidth to the rest of the visual system, estimated at just under 8 Mbit/s. This manifests itself in a number of ways, but the most important in terms of producing moving images is the way that a series of still images displayed in quick succession will appear to be continuous smooth motion. This illusion starts to work at about 16 frame/s, and common motion pictures use 24 frame/s. 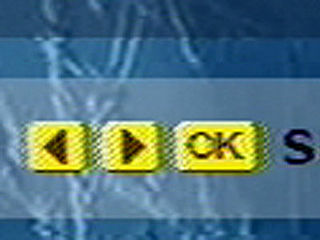 Television, using power from the electrical grid, tunes its rate in order to avoid interference with the alternating current being supplied – in North America, some Central and South American countries, Taiwan, Korea, part of Japan, the Philippines, and a few other countries, this is 60 video fields per second to match the 60 Hz power, while in most other countries it is 50 fields per second to match the 50 Hz power. In video, a field is one of the many still images which are displayed sequentially to create the impression of motion on the screen. Two fields comprise one video frame. When the fields are displayed on a video monitor they are "interlaced" so that the content of one field will be used on all of the odd-numbered lines on the screen and the other field will be displayed on the even lines. Converting fields to a still frame image requires a process called deinterlacing, in which the missing lines are duplicated or interpolated to recreate the information that would have been contained in the discarded field. Since each field contains only half of the information of a full frame, however, deinterlaced images do not have the resolution of a full frame. In its most basic form, a color broadcast can be created by broadcasting three monochrome images, one each in the three colors of red, green, and blue (RGB). When displayed together or in rapid succession, these images will blend together to produce a full-color image as seen by the viewer. One of the great technical challenges of introducing color broadcast television was the desire to conserve bandwidth, potentially three times that of the existing black-and-white standards, and not use an excessive amount of radio spectrum. In the United States, after considerable research, the National Television Systems Committee  approved an all-electronic system developed by RCA which encoded the color information separately from the brightness information and greatly reduced the resolution of the color information in order to conserve bandwidth. The brightness image remained compatible with existing black-and-white television sets at slightly reduced resolution, while color televisions could decode the extra information in the signal and produce a limited-resolution color display. The higher resolution black-and-white and lower resolution color images combine in the eye to produce a seemingly high-resolution color image. The NTSC standard represented a major technical achievement. The radio spectrum is the part of the electromagnetic spectrum with frequencies from 30 Hertz to 300 GHz. Electromagnetic waves in this frequency range, called radio waves, are extremely widely used in modern technology, particularly in telecommunication. To prevent interference between different users, the generation and transmission of radio waves is strictly regulated by national laws, coordinated by an international body, the International Telecommunication Union (ITU). The problem with this approach was there was no simple way to recombine them on the receiver end. If each image was sent at the same time on different frequencies, the images would have to be "stacked" somehow on the display, in real time. The simplest way to do this would be to reverse the system used in the camera: arrange three separate black-and-white displays behind colored filters and then optically combine their images using mirrors or prisms onto a suitable screen, like frosted glass. RCA built just such a system in order to present the first electronically scanned color television demonstration on February 5, 1940, privately shown to members of the US Federal Communications Commission at the RCA plant in Camden, New Jersey. This system, however, suffered from the twin problems of costing at least three times as much as a conventional black-and-white set, as well as having very dim pictures, the result of the fairly low illumination given off by tubes of the era. Projection systems of this sort would become common decades later, however, with improvements in technology. The first practical example of this sort of system was again pioneered by John Logie Baird. In 1940 he publicly demonstrated a color television combining a traditional black-and-white display with a rotating colored disk. This device was very "deep", but was later improved with a mirror folding the light path into an entirely practical device resembling a large conventional console. However, Baird was not happy with the design, and as early as 1944 had commented to a British government committee that a fully electronic device would be better. During its campaign for FCC approval, CBS gave the first demonstrations of color television to the general public, showing an hour of color programs daily Mondays through Saturdays, beginning January 12, 1950, and running for the remainder of the month, over WOIC in Washington, D.C., where the programs could be viewed on eight 16-inch color receivers in a public building. Due to high public demand, the broadcasts were resumed February 13–21, with several evening programs added. CBS initiated a limited schedule of color broadcasts from its New York station WCBS-TV Mondays to Saturdays beginning November 14, 1950, making ten color receivers available for the viewing public. All were broadcast using the single color camera that CBS owned. The New York broadcasts were extended by coaxial cable to Philadelphia's WCAU-TV beginning December 13,  and to Chicago on January 10,   making them the first network color broadcasts. After a series of hearings beginning in September 1949, the FCC found the RCA and CTI systems fraught with technical problems, inaccurate color reproduction, and expensive equipment, and so formally approved the CBS system as the U.S. color broadcasting standard on October 11, 1950. An unsuccessful lawsuit by RCA delayed the first commercial network broadcast in color until June 25, 1951, when a musical variety special titled simply Premiere was shown over a network of five East Coast CBS affiliates. Viewing was again restricted: the program could not be seen on black-and-white sets, and Variety estimated that only thirty prototype color receivers were available in the New York area. Regular color broadcasts began that same week with the daytime series The World Is Yours and Modern Homemakers . While the CBS color broadcasting schedule gradually expanded to twelve hours per week (but never into prime time),  and the color network expanded to eleven affiliates as far west as Chicago,  its commercial success was doomed by the lack of color receivers necessary to watch the programs, the refusal of television manufacturers to create adapter mechanisms for their existing black-and-white sets,  and the unwillingness of advertisers to sponsor broadcasts seen by almost no one. 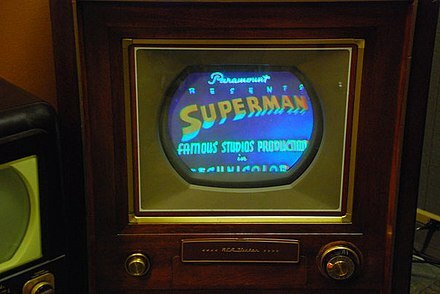 CBS had bought a television manufacturer in April,  and in September 1951, production began on the only CBS-Columbia color television model, with the first color sets reaching retail stores on September 28. But it was too little, too late. Only 200 sets had been shipped, and only 100 sold, when CBS discontinued its color television system on October 20, 1951, ostensibly by request of the National Production Authority for the duration of the Korean War, and bought back all the CBS color sets it could to prevent lawsuits by disappointed customers. RCA chairman David Sarnoff later charged that the NPA's order had come "out of a situation artificially created by one company to solve its own perplexing problems" because CBS had been unsuccessful in its color venture. Guillermo González Camarena independently invented and developed a field-sequential tricolor disk system in México in the late 1930s, for which he requested a patent in México on August 19 of 1940 and in the USA in 1941. González Camarena produced his color television system in his laboratory Gon-Cam for the Mexican market and exported it to the Columbia College of Chicago, who regarded it as the best system in the world. Goldmark actually applied patent for the same field-sequential tricolor system in USA on September 7 of 1940;  while González Camarena made his application in México nineteen days before, on August 19 of 1940. Although all-electronic color was introduced in the U.S. in 1953,  high prices and the scarcity of color programming greatly slowed its acceptance in the marketplace. The first national color broadcast (the 1954 Tournament of Roses Parade) occurred on January 1, 1954, but over the next dozen years most network broadcasts, and nearly all local programming, continued to be in black-and-white. In 1956 NBC's The Perry Como Show became the first live network television series to present a majority of episodes in color. CBS's The Big Record , starring pop vocalist Patti Page, was the first television show broadcast in color for the entire 1957-1958 season; its production costs were greater than most movies were at the time not only because of all the stars featured on the hour-long extravaganza but the extremely high-intensity lighting and electronics required for the new RCA TK-41 cameras. It was not until the mid-1960s that color sets started selling in large numbers, due in part to the color transition of 1965 in which it was announced that over half of all network prime-time programming would be broadcast in color that autumn. The first all-color prime-time season came just one year later. Early color telecasts could be preserved only on the black-and-white kinescope process introduced in 1947. It was not until September 1956 that NBC began using color film to time-delay and preserve some of its live color telecasts. Ampex introduced a color videotape recorder in 1958, which NBC used to tape An Evening With Fred Astaire, the oldest surviving network color videotape. This system was also used to unveil a demonstration of color television for the press. On May 22, 1958, President Dwight D. Eisenhower visited the WRC-TV NBC studios in Washington, D.C. and gave a speech touting the new technology's merits. His speech was recorded in color, and a copy of this videotape was given to the Library of Congress for posterity. Several syndicated shows had episodes filmed in color during the 1950s, including The Cisco Kid , The Lone Ranger , My Friend Flicka , and Adventures of Superman . The first two were carried by some stations equipped for color telecasts well before NBC began its regular weekly color dramas in 1959, beginning with the Western series Bonanza . The relatively small amount of network color programming, combined with the high cost of color television sets, meant that as late as 1964 only 3.1 percent of television households in the U.S. had a color set. But by the mid-1960s, the subject of color programming turned into a ratings war. A 1965 ARB study that proposed an emerging trend in color television set sales convinced NBC that a full shift to color would gain a ratings advantage over its two competitors. As a result, NBC provided the catalyst for rapid color expansion by announcing that its prime time schedule for fall 1965 would be almost entirely in color. ABC and CBS followed suit and over half of their combined prime-time programming also was in color that season, but they were still reluctant to telecast all their programming in color due to production costs. All three broadcast networks were airing full color prime time schedules by the 1966–67 broadcast season, and ABC aired its last new black-and-white daytime programming in December 1967. Public broadcasting networks like NET, however, did not use color for a majority of their programming until 1968. The number of color television sets sold in the U.S. did not exceed black-and-white sales until 1972, which was also the first year that more than fifty percent of television households in the U.S. had a color set. This was also the year that "in color" notices before color television programs ended[ citation needed ], due to the rise in color television set sales, and color programming having become the norm. Color broadcasting in Hawaii started in September 1965, and in Alaska a year later. [ citation needed ] One of the last television stations in North America to convert to color, WQEX (now WINP-TV) in Pittsburgh, started broadcasting in color on October 16, 1986 after its black-and-white transmitter, which dated from the 1950s, broke down in February 1985 and the parts required to fix it were no longer available. The then-owner of WQEX, PBS member station WQED, used some of its pledge money to buy a color transmitter. The first regular colour broadcasts in Europe were by the UK's BBC2 beginning on July 1, 1967 (using the PAL system). West Germany's first colour broadcast occurred in August (PAL), followed by the Netherlands in September (PAL), and by France in October (SECAM). Denmark, Norway, Sweden, Finland, Austria, East Germany, Czechoslovakia, and Hungary all started regular colour broadcasts around 1969/1970. Ireland's national TV station RTÉ began using colour in 1968 for recorded programmes; the first outside broadcast made in colour for RTÉ Television was when Ireland hosted the Eurovision Song Contest in Dublin in 1971. The PAL system spread through most of Western Europe. The system used in The Americas and part of the Far East is NTSC. Most of Asia, Western Europe, Australia, Africa, and Eastern South America use PAL (though Brazil uses a hybrid PAL-M system). Eastern Europe and France uses SECAM. Generally, a device (such as a television) can only read or display video encoded to a standard which the device is designed to support; otherwise, the source must be converted (such as when European programs are broadcast in North America or vice versa). Chrominance is the signal used in video systems to convey the color information of the picture, separately from the accompanying luma signal. Chrominance is usually represented as two color-difference components: U = B′ − Y′ (blue − luma) and V = R′ − Y′ (red − luma). Each of these difference components may have scale factors and offsets applied to it, as specified by the applicable video standard. Composite video is an analog video transmission that carries standard definition video typically at 480i or 576i resolution as a single channel. Video information is encoded on one channel, unlike the higher-quality S-video and the even higher-quality component video. In all of these video formats, audio is carried on a separate connection. A test card, also known as a test pattern or start-up/closedown test, is a television test signal, typically broadcast at times when the transmitter is active but no program is being broadcast. Used since the earliest TV broadcasts, test cards were originally physical cards at which a television camera was pointed, and such cards are still often used for calibration, alignment, and matching of cameras and camcorders. Test patterns used for calibrating or troubleshooting the downstream signal path are these days generated by test signal generators, which do not depend on the correct configuration of a camera. Digitally generated cards allow vendors, viewers and television stations to adjust their equipment for optimal functionality. The audio broadcast while test cards are shown is typically a sine wave tone, radio or music. Black-and-white images combine black and white in a continuous spectrum, producing a range of shades of gray. Broadcast television systems are encoding or formatting standards for the transmission and reception of terrestrial television signals. There were three main analog television systems in use around the world until the late 2010s (expected): NTSC, PAL, and SECAM. Now in digital terrestrial television (DTT), there are four main systems in use around the world: ATSC, DVB, ISDB and DTMB. NTSC-J was the analog television system and video display standard for the region of Japan that ceased operations in 44 of the country's 47 prefectures on July 24, 2011. Analog broadcasting ended on March 31, 2012 in the three prefectures devastated by the 2011 Tōhoku earthquake and tsunami. Dot crawl is the popular name for a visual defect of color analog video standards when signals are transmitted as composite video, as in terrestrial broadcast television. It consists of animated checkerboard patterns which appear along horizontal color transitions. 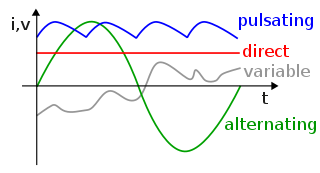 It results from intermodulation or crosstalk between chrominance and luminance components of the signal, which are imperfectly multiplexed in the frequency domain. Analog high-definition television was an analog video broadcast television system developed in the 1930s to replace early experimental systems with as few as 12-lines. On 2 November 1936 the BBC began transmitting the world's first public regular analog high-definition television service from the Victorian Alexandra Palace in north London. It therefore claims to be the birthplace of television broadcasting as we know it today. John Logie Baird, Philo T. Farnsworth, and Vladimir Zworykin had each developed competing TV systems, but resolution was not the issue that separated their substantially different technologies, it was patent interference lawsuits and deployment issues given the tumultuous financial climate of the late 1920s and 1930s. PAL-M is the analog TV system used in Brazil since February 19, 1972. At that time, Brazil was the first South American country to broadcast in colour. Colour TV broadcast began on February 19, 1972, when the TV networks Globo and Bandeirantes transmitted the Caxias do Sul Grape Festival. Transition from black and white to colour was not complete until 1978. Two years later, in 1980, colour broadcast nationwide in Brazil was commonplace. The color killer is an electronic stage in color TV receiver sets which acts as a cutting circuit to cut off the color amplifiers when the TV receives a monochrome signal. Color television as introduced in North America in 1954 is best described as being 'colored' television. The system used the existing black and white signal but with the addition of a component intended only for television receivers designed to show color. By careful application this 'colored' signal was ignored by ordinary TV sets and had negligible effect on the appearance of the black and white image. This meant that color programs were viewable on the many existing black and white receivers which fulfilled a requirement for 'compatibility' desired by the television industry. Once the so called 'composite' video signal containing the color component had been generated it could be handled just as if it were a black and white signal, eliminating the need to replace much of the existing TV infrastructure. Colorplexer was the RCA name for the equipment that created this 'composite' color signal from three separate images each created in the primary colors, Red, Green and Blue supplied by a color video camera. This process was by the standards of the day quite complex and demanded accurate control of all the various parameters involved if an acceptable color image was to be achieved. The simplification afforded by this 'head end' approach became evident and contributed to the gradual acceptance of color programming over the following decades. Premiere is the first commercially sponsored television program to be broadcast in color. The program was a variety show which aired as a special presentation on June 25, 1951, on a five-city network hook-up of Columbia Broadcasting System (CBS) television stations. Its airing was an initial step in CBS's brief and unsuccessful campaign to gain public acceptance of its field-sequential method of color broadcasting, which had recently been approved by the Federal Communications Commission (FCC) as the first color television broadcasting standard for the United States. ↑ "BBC - History - John Logie Baird" . Retrieved 2018-06-25. ↑ Kamm, Antony; Baird, John. John Logie Baird: A Life. p. 69. ↑ M. Le Blanc, "Etude sur la transmission électrique des impressions lumineuses", La Lumière Electrique, vol. 11, December 1, 1880, p. 477–481. ↑ R. W. Burns, Television: An International History of the Formative Years, IET, 1998, p. 98. ISBN 0-85296-914-7. ↑ Baird Television: Crystal Palace Television Studios Archived February 5, 2015, at the Wayback Machine . Previous color television demonstrations in the U.K. and U.S. had been via closed circuit. ↑ Kenyon Kilbon, Pioneering in Electronics: A Short History of the Origins and Growth of RCA Laboratories, Radio Corporation of America, 1919 to 1964, Chapter Nine – Television: Monochrome to Color Archived April 30, 2008, at the Wayback Machine , 1964. V.K. Zworykin with Frederick Olessi, Iconoscope: An Autobiography of Vladimir Zworykin, Chapter 10 – Television Becomes a Reality, 1945–1954 Archived April 19, 2008, at the Wayback Machine , 1971. "The system used two color filters in combination with photocells and a flying spot scanner for pickup." Alfred V. Roman, The Historical Development of Color Television Systems, doctoral dissertation, New York University, 1967, p. 49. ↑ "The World's First High Definition Colour Television System". www.bairdtelevision.com. Archived from the original on April 3, 2015. 1 2 Peter C. Goldmark, assignor to Columbia Broadcasting System, "Color Television", U.S. Patent 2,480,571, filed September 7, 1940. ↑ "Color Television Success in Test", The New York Times, August 30, 1940, p. 21. ↑ "Color Television Achieves Realism", The New York Times, September 5, 1940, p. 18. ↑ "New Television System Transmits Images in Full Color", Popular Science, December 1940, p. 120. ↑ "Color Television Success in Test," New York Times, August 30, 1940, p. 21. "CBS Demonstrates Full Color Television," Wall Street Journal, September 5, 1940, p. 1. "Television Hearing Set," New York Times, November 13, 1940, p. 26. ↑ Ed Reitan, RCA-NBC Color Firsts in Television (commented) Archived December 25, 2014, at Wikiwix. ↑ "Making of Radios and Phonographs to End April 22," New York Times, March 8, 1942, p. 1. "Radio Production Curbs Cover All Combinations," Wall Street Journal, June 3, 1942, p. 4. "WPB Cancels 210 Controls; Radios, Trucks in Full Output," New York Times, August 21, 1945, p. 1. ↑ Bob Cooper, "Television: The Technology That Changed Our Lives Archived December 23, 2014, at the Wayback Machine ", Early Television Foundation. ↑ Hempstead, Colin (2005). Encyclopedia of 20th-Century Technology. Routledge. p. 824. ↑ Baird Television: The World's First High Definition Colour Television System Archived April 3, 2015, at the Wayback Machine . ↑ "Washington Chosen for First Color Showing; From Ages 4 to 90, Audience Amazed", The Washington Post, January 13, 1950, p. B2. ↑ "Color TV Tests To Be Resumed In Washington", The Washington Post, February 12, 1950, p. M5. 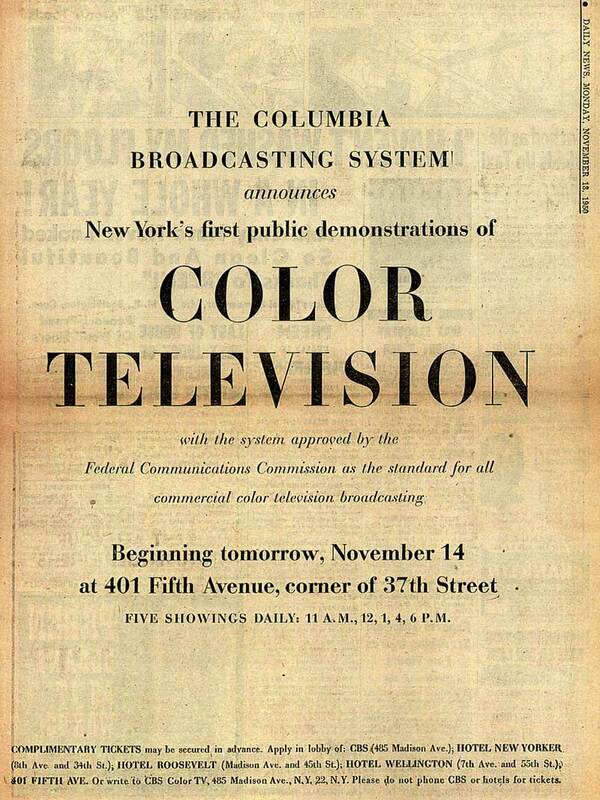 ↑ "CBS Color Television To Make Public Debut In N.Y. Next Week", The Wall Street Journal, November 9, 1950, p. 18. ↑ CBS Announces Color Television Archived August 4, 2008, at the Wayback Machine (advertisement), New York Daily News, November 13, 1950, p. .
↑ "You Can See The Blood on Color Video," The Washington Post, January 15, 1950, p. L1. "Video Color Test Begins on C.B.S.," New York Times, November 14, 1950, p. 44. ↑ "CBS Color Preview Seen By 2,000 in Philadelphia", The Wall Street Journal, December 16, 1950, p. 10. ↑ "CBS to Display Color Video in City Next Week", Chicago Tribune, January 6, 1951, television and radio section, p. C4. ↑ "Preview of CBS Color TV Wins City's Acclaim", Chicago Tribune, January 10, 1951, p. A8. ↑ "C.B.S. Color Video Presents a 'First'," New York Times, June 26, 1951, p. 31. ↑ Four-hundred guests watched the premiere commercial broadcast on eight color receivers at a CBS studio in New York, as no color receivers were available to the general public. "C.B.S. Color Video Presents a 'First"", New York Times, June 26, 1951, p. 31. A total of about 40 color receivers was available in the five cities on the color network. The CBS affiliate in Washington had three receivers and a monitor. "First Sponsored TV in Color Praised by WTOP Audience", The Washington Post, June 26, 1951, p. 1. Most of the remainder of the prototype color receivers were given to advertisers sponsoring the color broadcasts. "Today, June 25, 1951, is a turning point in broadcasting history" (WTOP-TV advertisement), The Washington Post, June 25, 1951, p. 10. ↑ Ed Reitan, "Progress of CBS Colorcasting", Programming for the CBS Color System. ↑ "CBS Color System Network Affiliates", Programming for the CBS Color System. ↑ "CBS Color System Makes Television Set Makers See Red", Wall Street Journal, October 17, 1950, p. 1. 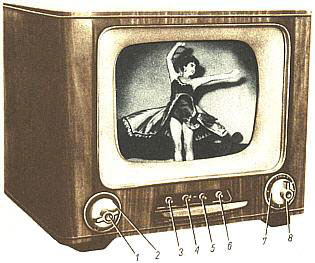 Three exceptions among the major television manufacturers were Philco, which offered 11 models that could show CBS color broadcasts in black-and-white; and Westinghouse and Admiral, which offered adapters to receive color broadcasts in black and white. "Philco Offers 11 TV Sets To Receive CBS Color TV in Black and White", Wall Street Journal, June 4, 1951, p. 9. "Westinghouse to Sell Adapter for CBS Color TV Signals", Wall Street Journal, August 7, 1951, p. 18. ↑ "Hytron's Deal With CBS Seen TV Color Aid", The Washington Post, April 12, 1951, p. 15. ↑ "CBS Subsidiary Starts Mass Production of Color Television Sets," Wall Street Journal, September 13, 1951, p. 18. ↑ "Para-TV Color Sets To Go On Sale Soon", Billboard , October 6, 1951, p. 6. ↑ "RCA to Test Color TV System On Three Shows Daily Beginning Today", The Wall Street Journal, July 9, 1951, p. 3. ↑ "CBS Says Confusion Now Bars Color TV," Washington Post, March 26, 1953, p. 39. ↑ "N.P.A. Decides to End Restrictions on Output Of Color TV Sets", The Wall Street Journal, March 21, 1953, p. 1. ↑ "F.C.C. Rules Color TV Can Go on Air at Once," New York Times, December 19, 1953, p. 1. 1 2 3 4 CBC Staff (September 5, 1991). "CBC in Living Colour". CBC News. Ottawa. Archived from the original on January 1, 2014. Retrieved 2014-01-01. ↑ "Color It Expensive". The Calgary Herald. Calgary, Alberta. 1966-09-01. p. 4. Retrieved 2012-04-14. ↑ "SRC Radio-Canada Network - History of Canadian Broadcasting". www.broadcasting-history.ca. Archived from the original on December 26, 2017. ↑ Roberto Diaz-Martin, "The Recent History of Satellite Communications in Cuba", Selection of a Color Standard Archived December 25, 2017, at the Wayback Machine , in Beyond the Ionosphere: Fifty Years of Satellite Communication (NASA SP-4217, 1997). ↑ Newcomb, Horace (2004). Encyclopedia of Television, second edition. 1 A-C. Fitzroy Dearborn. p. 1484. ISBN 1-57958-411-X. ↑ "Historia de la televisión en México". Boletín de la Sociedad Mexicana de Geografía y Estadística. Sociedad Mexicana de Geografía y Estadística. 97-99: 287. 1964. ↑ Leslie Solomon (July 1964). "Simplified Mexican Color TV" (PDF). Electronics World. 72 (1): 48 and 71. ↑ Butler, Jeremy G. (2006). Television: Critical Methods and Applications. Psychology Press. p. 290. ISBN 9781410614742. ↑ Gould, Jack (January 1, 1954). "Television in Review / Intra-Industry Row Over TV Color Credits Beginning to Assume Silly Proportions". The New York Times . Retrieved February 18, 2019. ↑ "Television in Review: N.B.C. Color," New York Times, January 5, 1954, p. 28. Two days earlier Admiral demonstrated to their distributors the prototype of Admiral's first color television set planned for consumer sale using the NTSC standards, priced at $1,175 (equivalent to $10,962in 2018). It is not known when the later commercial version of this receiver was first sold. Production was extremely limited, and no advertisements for it were published in New York or Washington newspapers. "First Admiral Color TV," New York Times, December 31, 1953, p. 22. "Admiral's First Color TV Set," Wall Street Journal, December 31, 1953, p. 5. "TV Firm Moves to Golden Triangle", The Pittsburgh Press, February 23, 1954, p. 9. ↑ Westinghouse display ad, New York Times, February 28, 1954, p. 57. Only 30 sets were sold in its first month. "Color TV Reduced by Westinghouse," April 2, 1954, p. 36. ↑ RCA's manufacture of color sets started March 25, 1954, and 5,000 Model CT-100's were produced. Initially $1,000, its price was cut to $495 in August 1954 ($4.62 thousand in today's dollars). "R.C.A. Halves Cost of Color TV Sets," New York Times, August 10, 1954, p. 21. ↑ "News of TV and Radio," New York Times, June 20, 1954, p. X11. ↑ After 15 episodes in color, Ford reduced costs by making only every third episode in color. "Ford Cuts Back on Color Film", Billboard, October 30, 1954, p. 6. The syndicated Cisco Kid had been filmed in color since 1949 in anticipation of color broadcasting. "'Cisco Kid' for TV Via Pact With Ziv", Billboard, September 24, 1949, p. 47. "Ziv to Shoot All New Series in B & W and Color Versions", Billboard, April 4, 1953, p. 10. ↑ Albert Abramson, The History of Television, 1942 to 2000, McFarland, 2003, p. 74. ISBN 978-0-7864-1220-4. ↑ RCA made about 95 percent of the color television sets sold in the U.S. in 1960. Peter Bart, "Advertising: Color TV Set Output Spurred," New York Times, July 31, 1961, p. 27. ↑ "ABC to Go Tint at First Sponsor Nibble", Billboard, September 4, 1954, p. 8. ↑ "Chasing the Rainbow Archived July 24, 2008, at the Wayback Machine ," Time , June 30, 1958. ↑ The Flintstones , The Jetsons , and Beany and Cecil . "A.B.C.-TV To Start Color Programs," New York Times, April 1, 1962, p. 84. "More Color," New York Times, September 23, 1962, p. 145. Ed Reitan, RCA-NBC Firsts in Television Archived December 19, 2008, at the Wayback Machine . Jack Gould, "Tinted TV Shows Its Colors," New York Times, November 29, 1964, p. X17. ↑ Clarke Ingram, The DuMont Television Network, Chapter Seven: Finale Archived August 4, 2009, at the Wayback Machine . The small amount of color programming that DuMont broadcast in 1954–1955 (mostly its show Sunday Supplement) was all from color films. 1 2 "Color Revolution: Television In The Sixties - TVObscurities". 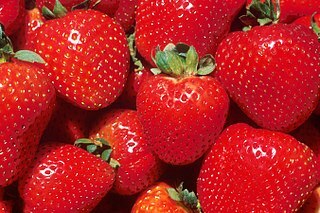 tvobscurities.com. Archived from the original on January 3, 2015. ↑ The exceptions being I Dream of Jeannie and Convoy . ↑ The game show Everybody's Talking. CBS's daytime soap opera The Secret Storm was the last network show to switch to color after airing its last black-and-white performance on March 11, 1968, making it the last black-and-white series on commercial network television. The last black-and-white series on network television was MisteRogers' Neighborhood on the non-commercial NET. Production of this series switched over to color in August 1968. ↑ Television Facts and Statistics – 1939 to 2000 Archived July 31, 2008, at the Wayback Machine , Television History – The First 75 Years. ↑ "THE ADVENT OF COLOUR TELEVISION: 1971". RTÉ Archives. April 18, 2006. Archived from the original on February 4, 2012. Retrieved April 30, 2013. ↑ The adoption of color television in Italy (Italian) Archived February 29, 2012, at the Wayback Machine . ↑ http://www.paradiso-design.net/TVsystems_worldwide.html World TV standards.